Buy now and pay later on all your nursery requirements and spread the cost with our flexible finance options with as little as 10% deposit! Online4baby is pleased to offer a range of simple finance options when you spend £500 in one transaction. Credit is provided by our reputable finance partner Deko, so now there’s no need to compromise on any of little ones kit and caboodle. Add items to your basket: If you spend £500 or more you’ll be eligible for our credit options. Choose ‘Buy with finance’ at the basket stage and fill in your delivery details. Sit back and relax. Once approved your items will be instantly delivered within 24hrs*. Relax then and don’t pay anything for around 30 days. 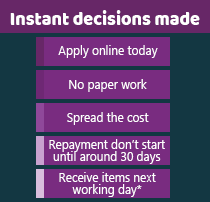 The application process takes a maximum of 3 minutes and you get an instant decision within 10 seconds. Do you meet the criteria to qualify? You must be a UK resident with at least 3 years continual address history (UK Mainland and Northern Ireland). You must be in regular full or part time employment (minimum 16hours per week), or a house person with a spouse in fulltime employment. If you are a retired individual, in receipt of a private or company pension (aged 50 or over at date of application). The deposit (minimum 10%/maximum 50%) must be paid using a credit or debit card. Please see below a typical example if you choose to spread the cost over 12, 24, 36 and 48 months based on a cash price of £500. There is a minimum spend of £500. You can enter your approximate cart total above and adjust the finance options on the right to calculate the totals. Choose how long you would like to take the finance for and your deposit amount. Totals will be displayed on the right. Online4Baby Limited acts as a credit intermediary and only offers credit products from Deko Ltd. Credit provided subject to age and status. Online 4 Baby Limited is authorised and regulated by the Financial Conduct Authority, register number 05332212 and act as a credit broker and not a lender. Online 4 baby Limited is a credit broker and not a lender. Finance is provided through the Deko platform by Omni Capital Retail Finance Limited. Omni Capital Retail Finance Limited is authorised and regulated by the Financial Conduct Authority (register number 720279). Deko is a trading name of Pay4Later Ltd which act as a credit broker and not a lender. They are registered in England and Wales (company number 06447333) and authorised and regulated by the Financial Conduct Authority (register number 728646). For more information please go to www.dekopay.com/support or visit www.dekopay.com.